2017 In A Sentence: The team failed to improve during its last three seasons, finishing the 2017 season with a 0-12 record and going 7 – 29 over the course of three season period and Sean Kugler resigned as the head coach in early October and outgoing athletics director Bob Stull turned to Mike Price to serve as the team’s interim head coach for the remainder of the season. Biggest Shoes to Fill: OG Will Hernandez was a second round NFL draft pick last year by the New York Giants–the fourth highest draft pick in Miners’ history. Hernandez started in all 49 games in his career with the Miners and is the only offensive lineman in school history to garner first-team All-Conference recognition in consecutive years. Key Player: Senior CB Nik Needham looks to lead the way for the Miner defense. He has recorded 24 pass breakups during his career and is tied for second with five other players on the program’s all-time list. 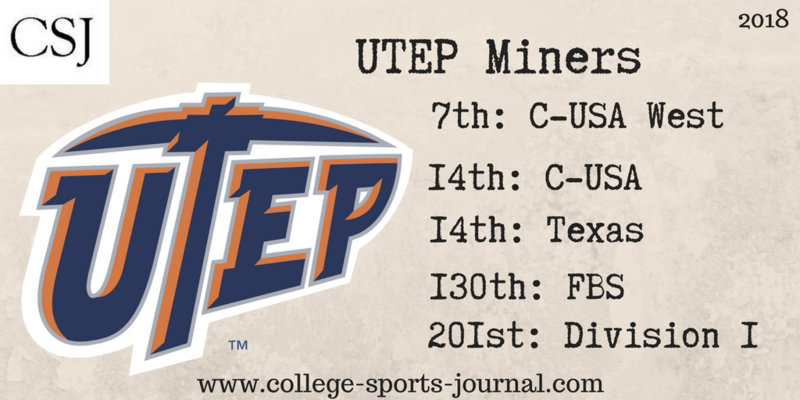 Needham only needs two pass breakup to be the overall leader in UTEP history. Last season, he registered a career-high 59 tackles (28 solo), eight pass breakups, 4.5 tackles for loss, a sack, an interception and a fumble recovery. Fearless Prediction: Dana Dimel was named the 26th head coach in UTEP football history. Dimel was previously the head coach at Wyoming and Houston. He most recently served as the ofensive coordinator, running backs coach and tight ends coach at his alma mater, Kansas State. With 14 starters (seven offensive, five defensive and two special teams) coming back, Coach Dimal hopes to climb out of the CUSA cellar but that likely will be a tall order.